This is a new feature DL introduced for our course. If Cyrillic spelling is too hard for you - pay attention to this little switch (desktop version, upper left corner, next to the Tips button) and you will get the phonetic spelling. To the naysayers: if you're learning this language to have pleasant small talk with your elderly Ukrainian grandmother who won't live forever, this option is very appealing, since you'll be able to learn at a faster rate. I don't recommend this to all people, but in that or a very similar circumstance, it can be helpful. The same can be said about learning enough Japanese to order sushi, or something to that effect. Having the option hurts no one. I agree. I wouldn't use this, but the people that are just on here to learn a few pleasantries will. The different isn't really between learning Ukrainian this way and learning Ukrainian using the right alphabet - it's between learning a little Ukrainian or not learning it at all. Those who are interested will realize they need the alphabet and that it will make it easier to read and type. A lot of people are intimidated by the alphabet at first and will pass on the language completely. I really doubt anyone with enough dedication to finish the tree is going to do so without eventually learning Cyrillic. That said, this should absolutely remain totally optional and I hope most people don't use it after a few test lessons. I don't care about the fact that the option is there. What really annoys me is that this option is set to be default. Even if you set it to Cyrillic, and then you switch to a different language and then back, it goes back to Latin. To be honest, I think even in that case it would be silly to not learn Cyrillic, since it is very hard to actually write Ukrainian in English. Plus it really doesn't take all that long. It's not like it's Morse code (which I have actually learned :P). On top of that, you open up a lot more learning resources. It's a bit like in programming where you sometimes need to spend some time learning a new programming language or tool to save you time in the long run. Of course I'm not saying that the option should be removed. I'm just saying that this should be made very clear at the beginning of the course. I'm so glad that I started before the option was added. I may have made the dumb decision of not learning Cyrillic. Wow, I guess they are dumbing down duo. Hopefully this option only is available for the first few lessons, no more. Duo would be better off developing a customizable "learn/practice a non-Latin alphabet" module./skill. Or links could be posted to something offsite, maybe in Anki or YouTube. As greg mort points out, learning the Cyrillic alphabet is not very difficult. It just takes a little application and a few hours of practice. While perhaps tempting at first (at first my thoughts were aligned with Luke's below) using the romanized system is actually harder, especially when you consider the exercises where you have to listen and type the Ukrainian sentences. The romanization is a snare, and it will only slow one down and make learning more difficult than it has to be. This is coming from someone who doesn't like Cyrillic script at all. And I realized I don't like it because there's more responsibility to master it since there's so much of it that is familiar already! Not wanting to take the time to learn it is pure laziness on my part, and I have to overcome it. This is getting so annoying. I cannot set it back to Cyrillic during timed practice, so have to go back to untimed practice and place the settings. Also the Latin script should NOT be the default, and if I change the settings it should remember it instead of making me do this every frikkin time. Has this been fixed yet? I just only got this rubbish Latin script today and I mainly do timed practices at the moment since I'm traveling. I echo everyone saying that Latin script should not be the default. People who don't want Cyrillic should be the ones to have the hassle. I personally wouldn't mind this so much if it didn't keep resetting my default to Latin characters every time I switch languages and go back to Ukrainian! I think it's fine that this is an option, but if you switch to Cyrillic letters, Duolingo should be able to save your changes without resetting it to Latin by default. It would be better if this was left as an option instead of as a default. Having to keep switching it off is annoying. Also surely it is better to make sure learners know which is the real script by presenting it first.I thought the course did a good job of teaching Cyrillic. I had never tried it before and have not looked elsewhere for material but am finding it increasingly easy to read. Although it does take more review than other courses require so the xp for repeated lessons ought to be higher. And the timed practice needs to freeze or add time to allow for keyboard changes, or only go in one direction in any session as you can't do more than a couple of questions the way it is. I do not like this idea at all, however if you want to use this feature it should default to Cyrillic alphabet. Sure, reading Cyrillic can be hard for the first few days. An option of being able to see words, which are written in Cyrillic, as their Latin script counterparts (upon hovering or something) would be a help for anyone struggling to learn the script (Kinda like how people use furigana for kanji in Japanese? Latin:Cyrillic=Furigana:Kanji). However, there are many problems with only using the Latin script in the long term (regarding both pronunciation and reading/writing skills). On the other hand, I think it's very tedious to switch keyboard inputs back and forth for every single question that needs to be filled. Yes, you can use shortcut keys, but it's tedious (and can be a complicated mess on a Linux computer! e.g. Japanese layouts). I think an automated input system that is native to duolingo that would switch alphabets automatically depending on which language the question is being asked in would be the way to go. (yes, I realize this may not work on mobile devices). In conclusion, I think the thought here could be an advance in the right direction, but the method used was a mistake. On iOS input language switches automatically, one of the few things where mobile version exceeds PC counterpart. Nice! That exceeds Android too, or at least my setup on it. This isn't an A/B test. Is this just an option, that we can ignore? I think for learning purposes it would be best to always show the Ukrainian alphabet. Here is my proposal for a better feature: By default it only shows the Ukrainian text. Then there is an option to also display the transliteration to the Latin alphabet. You mean display it underneath or something? That would be much better. I understand that this might make it easier to learn Ukrainian, but Ukrainian uses the Cyrillic alphabet, not the Latin alphabet. This is allowing people to cheat themselves out of actually learning the language! I took Russian in college and was perfect with Cyrillic by the end of the first week! It is really not the most daunting part of any of its languages. WHY oh WHY does it DEFAULT to LATIN script?? Make it an option, fine... but WHY.... WHY????????????? Duolingo now seems to be remembering my choice to read Ukrainian in Cyrillic script: a big THANK YOU to the team for fixing this. Does not work for me. After switching courses it is back to the new default of latin alphabet. Sorry to hear that. Perhaps it's an A/B test. Have you tried clearing your browser cache? I have not. But it works now. However (and this is pretty bad) in timed practice you get latin script and there's even no way to turn it off. Edit: Nope, it still switches back to latin. Embarrassed to say it took me until Level 8 to even notice the feature to toggle to Cyrillic script for the tips and notes. I had just resigned myself to reading the latinized prompts. Learning the Ukrainian words is also kind of hard. Can I get an option to switch all of the Ukrainian words to an English translation? That would make things much easier for me. Thanks. Took me a second :D That was great! How can stop seeing Romanized Ukrainian in the mobile website? HI, I had the same issue, you must go to the View Full Website option, then enter a lesson and there you have the switch button. not available in the mobile version. The worst decision ever!!!! How can I change it back? Reading Russian or Ukrainian languages without Cyryllic letters does not make any sense! I'm using a mobile version where everything is fine but when I change to my desktop it's annoying to see 'normal' letters instead of Cyryllic one. Actually it is hard to read Russian or Ukrainian language without Cyryllics. Please anyone can help? I want to read only in Cyrillic script. I cannot type in cyrillic from my end. But I will tell you that I cannot continue studying with Duolingo if I have to read Ukrainian in latin script.. Please help me out in this or I will have to look for other options. On the full website version there is a bar on the top left to change. If you use the app it is in Cyrillic and you can download a keyboard like swiftkey to type. Why has this option now gone? How do we get it back?? I can't find the button so I am seeing Cyrillic and typing Latin. Did they remove it or something? I can't get Cyrillic letters and there's no Tips button. 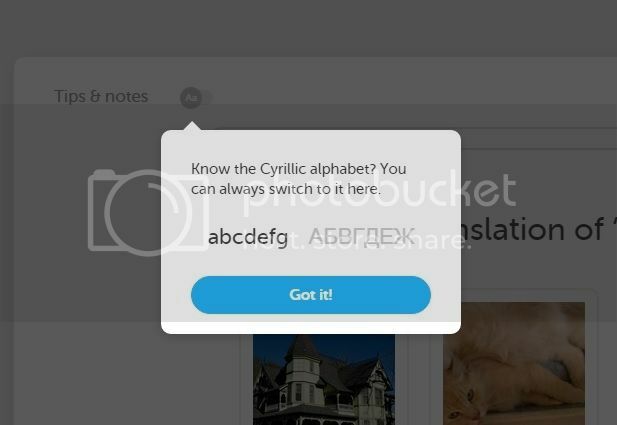 Cyrillic in terms of your typing them isn't in duolingo but in the system to get them you need to go into windows settings as add a Russian keyboard. then you will be able to switch your keyboard to type Cyrillic and back simply by selecting it on the taskbar. when will be the russian course available from your phone? I have the Duolingo app on my phone, you cannot use Russian? You should to able to excess it I can use Ukrainian and Spanish on my phone Uki is beta. I want to switch form cyrillic to latin, but I can not find this button!? Several posts above: "lprada1: HI, I had the same issue, you must go to the View Full Website option, then enter a lesson and there you have the switch button. not available in the mobile version." I can't find the switch to toggle to Cyrillic. I don't see a Tips button. I want to type in Cyrillic and I can't. I can't find the switches or buttons. I don't see a tips button. there is nothing in the upper left corner. It's impossible to read all the comments... where is the button? Is it more one "improvement" of Duolingo actualizations? What is happening in Duolingo world? There is a screenshot in SergioRuido's post. The button is in the top left corner of the task screen (the one that appears when you start a training session). You are right. I have checked it and the button is really not there anymore. I do not know why they removed it, but I hope that you get the tasks in Cyrillic now and not in Latin, because otherwise it is a severe bug. You know that this is a Ukrainian discussion, right? Anyways, it is the same here. If it will make things easier for you, you can still type your answers in Latin and it should accept them. I am aware the discussion is Ukrainian yes. But i didnt know you could use the other alphabet thank you. I don't see any "tips" button. Where is it? It is not available on mobile (at least not with my most recent update" but I am using the computer today and it is a lightbulb. I have been learning on my phone and so I had downloaded the keyboard. But right now I am on a library computer and had not realized all the ins and outs. I started at the beginning and was just getting into the lessons where I needed to type in Cyrillic and I took a chance and tried to do it phonetically (and was actually pleasantly surprised so that I knew I could continue). After that I decided I had better find out how it is supposed to work. That lead me to this post so now I know how to work both options when I am on the computer, especially one that is not mine. So I appreciate having both options available for that reason. I'm loving this amazing language more every moment! Ukrainian switching to Cyrillic from Latin? Ukrainian Troubleshooting Topic: Unable to access Cyrillic-->Latin switch. What is the difference between треба, потрібно and необхідно ?